God Our Father and Jesse welcomed Rose to Heaven on Wednesday, May 31, 2017 with her family at her side. She was a loving mother and grandmother of 81 years. 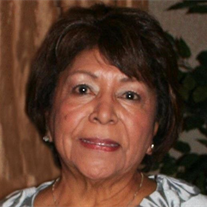 Daughter of the late Ambrosio and Toribia Casarez, Rose was born August 2, 1935 in Sebewaing, Michigan. She was married to Jesse Mendoza Guevara on September 3, 1960. He predeceased her March 5, 2017. Rose received her Master’s Degree at the University of Michigan. She was employed at the State of Michigan as a Medical Case Manager and a substitute teacher at Nouvel Catholic Central. Rose was a member of Holy Spirit Catholic Church, involved in Parish Ministry at the church, Knights of Columbus Council #4232 Ladies Auxiliary, Moose Lodge #82. Rose enjoyed watching her children and grandchildren in their sports activities, an avid Detroit Sports Fan and enjoyed golfing. Surviving to cherish her memory are two sons and two daughters, Julian and Alicia Guevara, Bridgeport; Catherine and Daniel Beck, Rochester; Christine Guevara, Saginaw; James and Rebecca Guevara, Saginaw; nine grandchildren, Angelina, Julian II, Alyssa (Vincent), Joshua, Anthony, Victor, Noah, Raul and Rosalie; three great-grandchildren, Royal, Rosie and Ezekiel; one brother, Leo Casarez, Palatine, Illinois; three sisters, Connie Castanon, Saginaw; Josephine Espinoza, Saginaw; Margaret and Ralph Gonzales, Saginaw; several nieces and nephews. Rose was preceded in death by her son, James Robert Guevara, two sisters and three brothers, Mary Casarez, Judy Jaime, Jesse, Frank and Michael Casarez. Funeral Liturgy will take place 11:00 a.m. Monday, June 5, 2017 at Holy Spirit Catholic Church, 1035 N. River Rd., Saginaw. Rev. Fr. Peter Gaspeny will officiate. Honoring Mrs. Guevara’s wishes cremation will follow with committal of cremains in Mt. Olivet Cemetery. Friends may visit at The Snow Funeral Home, 3775 N. Center Rd. (between Shattuck and McCarty), where the family will be present on Sunday from 1:00 p.m. to 7:00 p.m. and at the church on Monday from 10:00 a.m. until time of Mass. The Knights of Columbus Council #4232 Ladies Auxiliary will pray the Rosary at 3:00 p.m. Sunday and a Vigil Service will take place 6:00 p.m. Sunday at the funeral home. Those planning an expression of sympathy may wish to consider memorials to Holy Spirit Catholic Church or the Sisters of St. Clare.